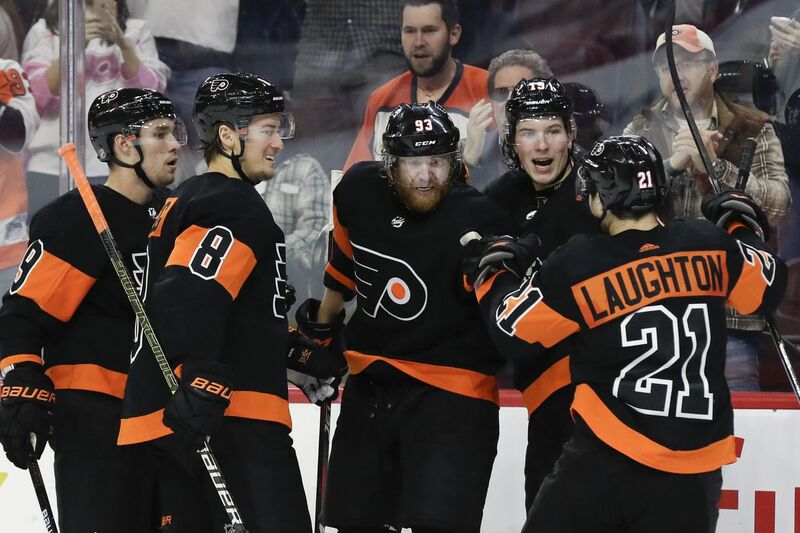 Flyers right wing Jakub Voracek celebrates his game winning third-period goal with teammates defenseman Ivan Provorov, defenseman Robert Hagg, center Nolan Patrick and center Scott Laughton against the New Jersey Devils on Saturday, October 20, 2018 in Philadelphia. Simple is a lot harder than it sounds. Put another way, too much can sometimes add up to too little in hockey. The Flyers are living, breathing examples of that these days. For much of their eight games played this season, they have struggled to settle pucks, have been plagued by ugly giveaways and missed opportunities, and have passed the puck around so much on power plays that they seemed to hypnotize only themselves. Such was the case for much of a dominant 5-2 victory over the New Jersey Devils on Saturday afternoon at the Wells Fargo Center. The Flyers controlled play for the bulk of the game and nearly doubled up the Devils in shot attempts over two periods, yet after 40 minutes they held just a one-goal lead, due largely to a bad case of the yips. Consider Jake Voracek's afternoon, for example. Chastised on social media for some ole'-style backchecking in a 6-3 loss to Columbus on Thursday and dropped recently from the first line to the second, he fought the puck for a chunk of Saturday's game, and on several occasions it led directly to New Jersey scoring chances. In other words, you stay with it. Voracek scored twice and assisted on another goal in the final 21 minutes, 4 seconds. Yes, his eagerness to go on the attack sometimes results in the Flyers' being attacked, but his swashbuckling style can also be incredibly dangerous, especially when he enters the zone with speed and the puck. That's how the Flyers finally broke through to take a 2-1 lead late in the second period. As Devils defenseman Will Butcher knocked a puck from the air to his feet outside his own blue line, Voracek swooped in, stole it, flashed down the left side of the ice, and laced a pass through two defenders to Nolan Patrick, who fired it into a wide open net. Another early theme: Prosperity is short-lived. After surviving a scare when a puck fluttered behind their goaltender, Keith Kincaid, in the early seconds of the third period, the Devils applied pressure, drew a high-sticking call on Jordan Weal, and tied it at 2-2 when Brian Boyle fired a puck past Brian Elliott from the right circle at 2:25 of the third period. That kind of a sequence has proven toxic to this team in the early going. Not Saturday. The third period became a test of wills, of endless puck scrums along the boards, and mid-ice wars. Indeed, the game pivoted via the same type of play New Jersey has so often beaten the Flyers with. With the Devils pressing for the lead, Ivan Provorov – another player under the glare recently – chipped a puck past two Devils along the boards and out of the zone. Swooping again, Voracek raced down the right side as Scott Laughton joined the rush, then went backhand to forehand to push the game-winner past Kinkaid at 16:50. The Flyers added two empty-netters – the first after Provorov blocked a shot with his dome. It led to his second assist of the game. A simple play, really, using your head. But a hard way to do it too. The Flyers had 69 total shot attempts, New Jersey 45. The Devils blocked 27 Flyers attempts, and 21 more missed the net. … Shayne Gostisbehere had 10 shot attempts – one on goal, five that were blocked, and four that missed.The Flyers were 44-for-60 (73.3 percent) on faceoffs, with .Sean Couturier winning 14 of 16.